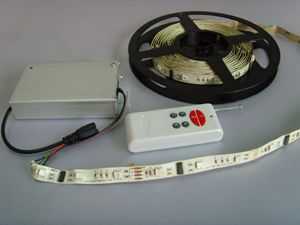 12V RGB LED light strip consists of 150 bright SMD Leds mounted on a flexible printed circuit board (PCB ) enclosed in waterproof plastic, each LED has 120 degree viewing angle, 16.4 Ft/ 5meters (can be cut every 3 LED's at marked intervals) but then the it needs to be closed up to make it waterproof again, must be connected to a 12V power supply. 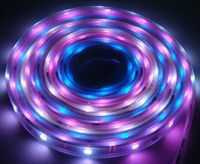 RGB must be used with a controller to make lights work. If reel is cut and used seperately, each scction would need it's own controller. 12V power supply can be purchased seperately.